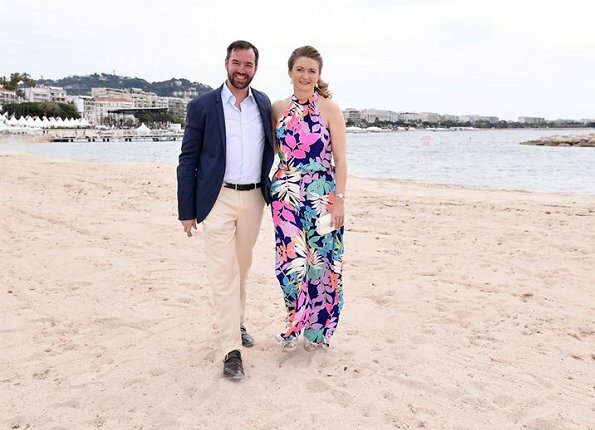 On the second day (last day) of their Cannes visit, Hereditary Grand Duke Guillaume and Hereditary Grand Duchess Stéphanie of Luxembourg attended a series of events at the Cannes Film Festival 2017 to support Luxembourg's film sector. The HGD couple also visited the Marché du Film (Film Market) on May 18, 2017. 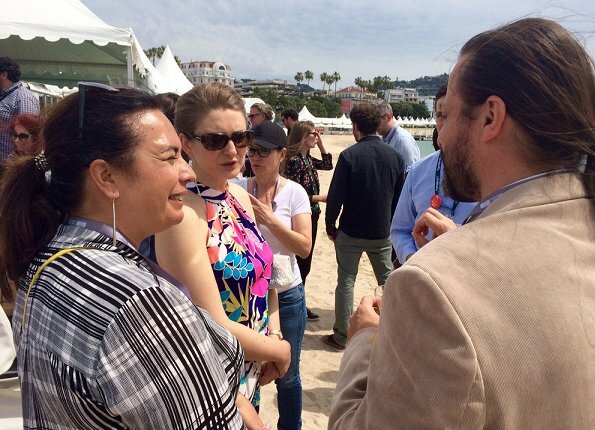 I love her hair, sunglasses and I think the pantsuit is fun and hip especially for Cannes. I like the colorful print as it is playful. But the way the leg part falls in some pictures looks off. I know wind and movement can cause that..but seems perhaps not a perfect fit? BUT I am thrilled to see her dresses like this! She looks good and very happy! I still give her a thumbs up! Wow!! Like "Holidays in St. Tropez.."! Congratulations, Stephanie! What a lovely surprise to see this photo - the first one is particularly charming. She looks cute, the colours are lovely and she looks perfect for the location and event. He also looks good. (Diane, I agree about how the pants look in the later photos but I assume it's the breeze that causes that. I did prefer it when I thought it was a dress). I'm now convinced all these great recent looks have not been a coincidence - someone is giving her expert advice. So happy! I love this look amd agree with you @Heather! If this was maxi dress I would have loved it, but these jumpsuits never please my eye. Color and pattern are nice. Cute outfit, the both look great ! Its great to see Stephanie in something more playful and colorful. She looks very lovely. The pants are a little too long but overall once again very nice surprise. Great! Very colourful, bold, different, I love it! It's like we're looking at new version of Stephanie ! Gone are the unflattering wide length black pants, gone are the plastic hair clips. Now it's bright and beautiful colours, statement jewellery, styled hair, flattering make up. And what a difference all these changes seem to have made to her demeanour, she looks happy and relaxed ! Been a while since we've seen this side of Stephanie, I for one, hope this is a taste of more to come ! Encore une fois un sans faute, ce que c'est agréable. Elle est ravissante! they both are happy and nice outfit. Doesn’t Stephanie look great! What a difference from previous engagements! I do take the point about the awkward fall of the pants legs in some of the pictures but I should note that she may have a “static cling” issue with the wide pants legs. I have a very pretty caftan-like dress that clings no matter how much anti-cling spray I use. So I can't wear it in public. I love the cut-in shoulders on her. So pretty. 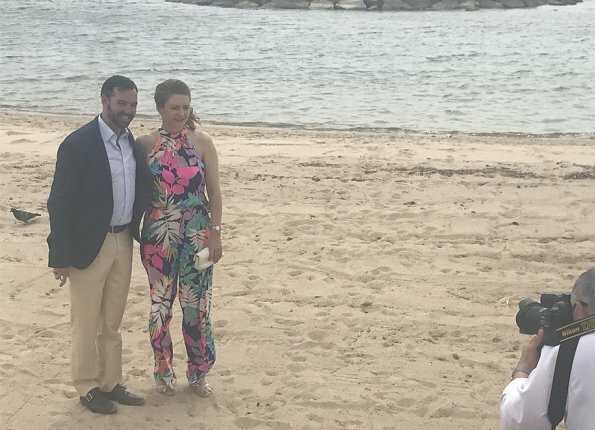 Why is her husband wearing a blazer and business shoes on the beach? Stephanie is dressed perfectly for that but her husband looks kind of silly. He should at least have taken the shoes off and rolled up his pant legs and lost the blazer! 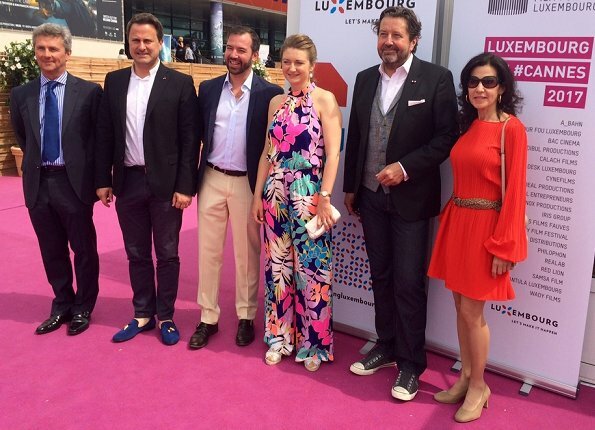 And though I didn’t comment on the earlier pictures for the evening event (yesterday?) 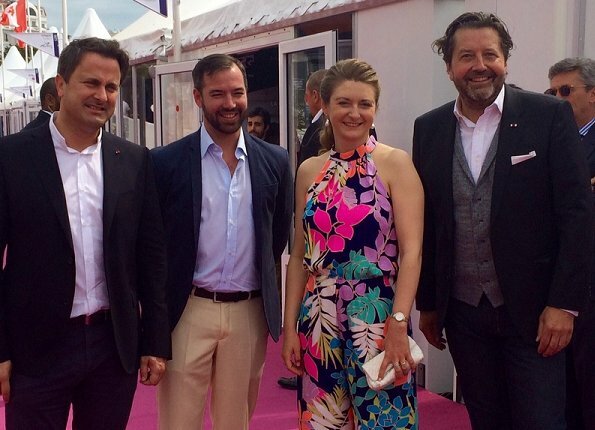 all I can say is that Stephanie looked absolutely divine in the evening outfit. Dress, earrings, hairstyle, makeup – all fantastic. Fantastic. Grand Duchess looks young, happy and vibrant!!! Nice to see a young woman that looks healthy and does not need to think she has to be a size zero. Lovely - a summery print and an on trend piece of clothing. She looks wonderful recently.